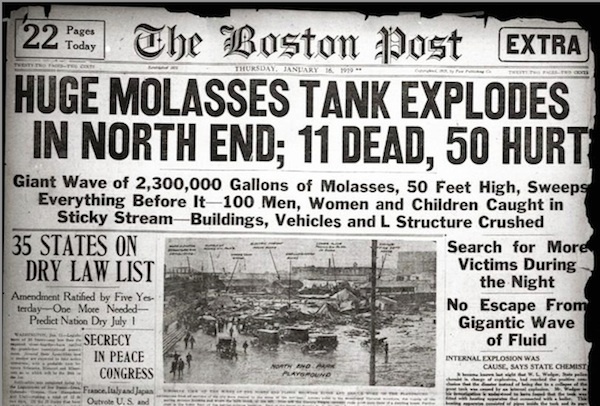 Molasses tanks containing over 2 million gallons in the north end exploded, unleashing a 40 foot wave of molasses that knocked down elevated train tracks, buildings, and ensnared people and horses. 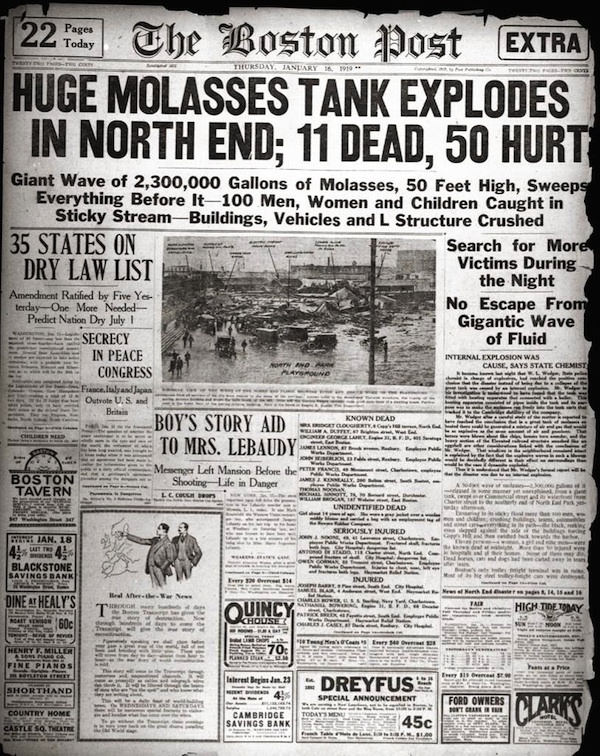 Basements were flooded with 2-3 feet of molasses. 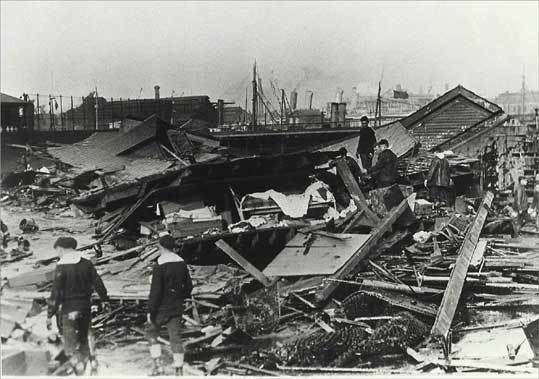 "US Industrial Alcohol, the company owning the tank, steadfastly blamed anarchists. "You said time was infinite, so why the watch wrapped around your wrist? ^ Awesome. I'll take credit for it.All you white kids look alike when you're still covered in baby fat, so I was getting bored with the non-stop WASP parade. Alas, I think they were just trying to avoid having to compensate the injured and kin of the deceased.You said time was infinite, so why the watch wrapped around your wrist? This is a pretty good read on the event, aftermath and trial. http://www.amazon.com/Dark-Tide-Great-Boston-Molasses/dp/0807050210We are the small axe. I remember the exact moment I was told about this as a kid. I was eating ramen noodles. I'm going to eat some ramen today in memoriam. 100 YEARS AGO TODAY.All you white kids look alike when you're still covered in baby fat, so I was getting bored with the non-stop WASP parade. ^hahaha, next maybe a tidal wave of microbrew?